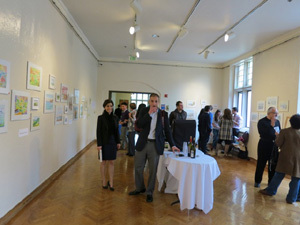 A collection of over 70 watercolor paintings by Dr. Haroutune Armenian, President Emeritus of the American University of Armenia and Associate Dean of Academic Programs and Professor in Residence in the Department of Epidemiology at the UCLA Jonathan and Karin Fielding School of Public Health was exhibited at the UCLA Kerckhoff Art Gallery on March 16 and 17, 2012. 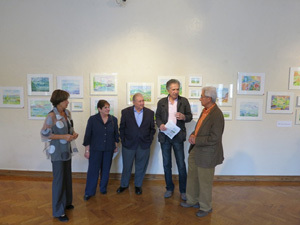 These paintings reflected “expression of places where a peaceful moment got transformed into a positive reality.” Thirty two of the paintings were sold to support a new fund for UCLA students to do internships and research at the American University of Armenia, where Dr. Armenian was President for 14 years. The acclaimed watercolor artist and accomplished epidemiologist finds parallels between art and science: “Donabedian, defined parsimony as one of the essential characteristics of good quality health care. Similarly, for mathematicians there is an appreciation of the simpler solutions of a problem as the more elegant. Thus, there is a universal value in achieving the best of the results with the least number of steps, and the least amount of resources. 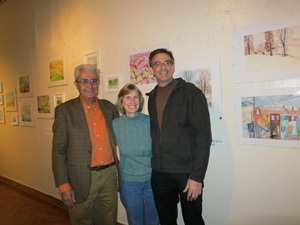 Thus, watercolor paintings that are genuine expressions of art fulfill these qualities of parsimony and elegant solutions.” His art work has been published in two books “Colors and Words: From Armenia and Beyond” and “Past Does Not Yet Melt Here.” You can find more on Dr. Armenian’s art work at http://www.armeniancolors.com/ .